Most recently, I’ve had a lot of readers email me with questions about the American Express Business Gold Card. I wrote about the improved offer in this post. It currently offers 40,000 points as a signup bonus, which is the highest I’ve ever seen for a card with no annual fee. In their emails, readers have said they’re not at the point where they can put $5000 of spend in the first three months. I personally think that it shouldn’t be that difficult to generate $1667 of spend a month, even with an American Express. Today, I want to talk about another potential way to increase your credit card spending for purchases you already make, through a site called Plastiq. 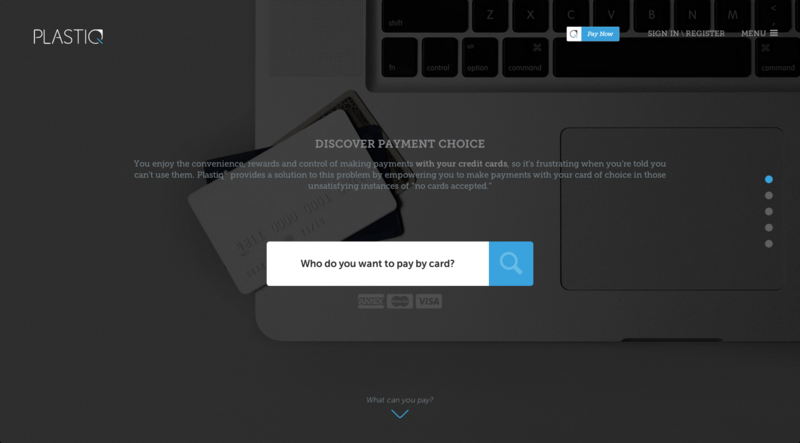 Plastiq is an online site that allows Canadians to pay expenses using credit cards where they normally aren’t accepted through regular payment options. The most common expenses that come to mind where you can’t normally pay with a credit card include your income and property taxes, as well as (university tuition). Those are normally significant chunks of money you HAVE to spend annually, so being able to pay them with a credit card especially with minimum spend is especially great. You can see what other companies partner with Plastiq in their company directory. Most of their partners are located in Canada, although they have some companies in the US too. I’d assume that they’d charge in USD there. It’s a pretty straightforward process, where you signup on their site, and submit your credit card information similar to making a purchase online. The downside is that there’s a 1.99% service fee involved. I wouldn’t recommend for paying normally, except in select circumstances where you’d value the points you get from the purchase. The ~2% fee means that you’re purchasing points for 2 cents each, unless you’re getting 2 points/$, where then each mile would cost 1 cent apiece. That would happen for example if you paid with a Canadian Capital One Delta Mastercard. So if you valued Delta points at more than a cent a piece, it might make sense using it normally. However, in regards to fulfilling minimum for a signup bonus, the value proposition significantly changes if that spend pushes you above spend level required to unlock the signup bonus. Take for example the 45,000 points offered with the small business AMEX. After fulfilling the minimum spend, those points are worth at a minimum $450, and if redeemed correctly you’d get a value of at least $600-650. If you’re able to generate normally $500 normally on your card, to fulfill the rest of the $5000 spending, you could pay $3500 with Plastiq for tuition, tax, utilities, rent, or other expenses you’d normally pay with your bank account. That will generate a fee of $70 for using Plastiq. To unlock a valuable signup bonus, it is definitely worth considering. Heck, even I might pay my tuition with it! If you can legitimately generate spend from your business, I’ve also talked about using Square to generate spend for free. Using Plastiq to meet your minimum spend, although not free, may be worth considering in certain circumstances to unlock valuable signup bonuses, such as the one on the American Express Small Business Gold Card. I hope this helps, and as usual I’m happy to answer any questions in the comments or via email. I looked into Plastiq sometime ago and was somewhat turned off as the fee was 2.49% but it looks like they have dropped it to 1.99% now. They also had an Air Miles offer that ended on Sep 30 but maybe that will come back sometime soon. If you combine the Air Miles offer with your credit card rewards it may be worth it like you mention above. Besides the Canadian Capital One Delta Mastercard, are there any that give more than 1:1 ? I don’t think there are any others which make it a good proposition to use normally outside of fulfilling a minimum spend, unfortunately. The problem with Plastiq as a choice is that Amex is very limited in what can be paid. I talked to Plastiq and they acknowledged that it isn’t as easy to get Amex taken as payment as MC and Visa. I have only been able to pay my Enbridge account. Can’t do my line of credit, hydro company. Plastiq isn’t the most intuitive site – ideally I’d like to be able to see what companies are payable by Amex. The way I look at it, I paid $8.00 in fees for a $500 Enbridge bill (paid in advance to speed up the $5000 requirement) and I got 1000 points for a bill I have to pay anyway. I’m okay with that. I see you haven’t approved my previous comment. Please don’t encourage people to use Square. As you likely know by now by now, people are getting their credit card accounts, esp Amex, closed. Even the ones they didn’t use Square to MS on. As I said in my reply to your comment this morning, I’ve edited my post to reflect the new info about Square. Any opportunity to use this with Petro Pivot Visa?? How would you use this with Pivot? fund pivot at Petro with AMEX for 2x – pay fees – use pivot for plastiq to pay bill pay fee?? – thanks! 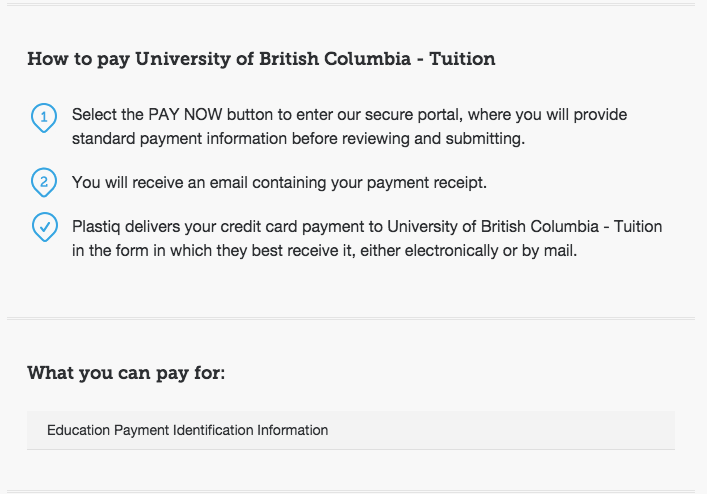 Why not use the Canadian Tire MC to pay for tuition expenses, property taxes, utilities, etc.? You can use the CT card to make payments for things that otherwise you cannot use credit cards to pay. There’s no fee and there’s 1% back. Canadian Tire pays them on your behalf and it looks like a regular bill payment to whoever you are paying. I suggest doing some google searching or there’s a thread of RFD that talks about it. Of course, no credit card can be used to pay another credit card unless it’s a balance transfer. You could, although here I was specifically talking about using Plastiq to meet minimum spends for credit cards. As I mentioned in the post, there is little use for it due to the fees otherwise. Is there any way to pay a mortgage with a credit card? You can pay your mortgage with Plastiq. I heard some feedback that RBC credit card codes Plastiq as cash advance therefore it won’t be qualified as min spend. Do you know about this? Hi! I heard some feedback that RBC credit card codes Plastiq as cash advance therefore it won’t be qualified as min spend. Do you know about this?